Make no bones about it, osteoporosis is rampant in America. 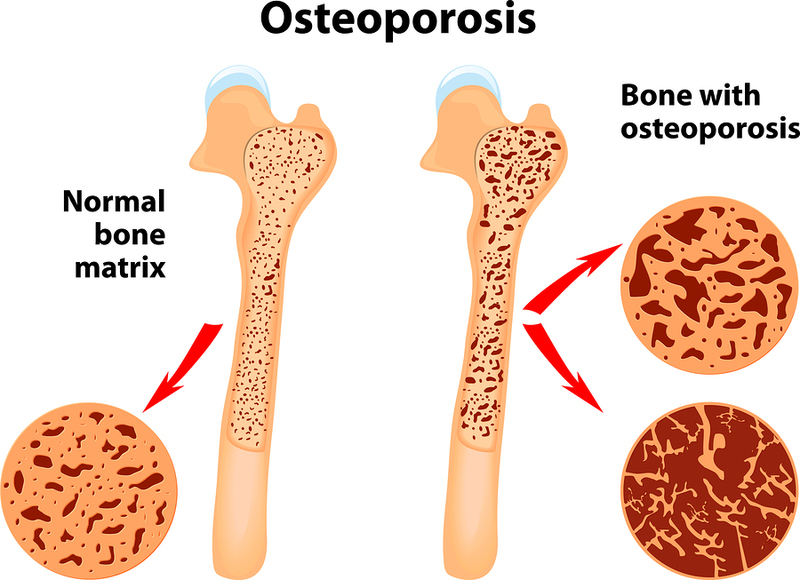 Osteoporosis is a major public health problem that is characterized by low bone mass and increased susceptibility to fractures, primarily of the hip, spine, and wrist. (8) Although the disease is more prevalent among women, it does affect men, as well. Osteoporosis means porous bone. It occurs when the body loses too much bone, makes too little bone, or both. This results in bones becoming weak and increases your risk of a break. The risk of fracture from osteoporosis increases with age. (12) Osteopenia refers to bone density that is lower than normal, but not low enough to be considered osteoporosis. Your bones are weaker than normal but wouldn’t break easily. Follow up with your physician to measure your 25-hydroxy vitamin D levels in order to assure that you’re within the optimal range. And on that note, get out and enjoy the sun! Natural sunlight is a great way to soak up vitamin D naturally. Bisphosphonates are a common class of bone drugs used to treat osteoporosis. Brand names include Fosamax, Zometa, Reclast, Boniva, Actonel, and Aclasta, to name a few. Bisphosphonates were originally used in the textile, fertilizer and oil industries as corrosive agents. If that isn’t enough to make you think twice about putting them in your body, read on to learn how they actually weaken your bones. Our body has a natural process to rebuild and rejuvenate our bones. Cells called osteoclasts are constantly breaking down old bone and osteoblasts are building new bone tissue to keep our bones strong. Bone drugs interrupt this natural process by slowing the bone breakdown process, inhibiting bone resorption and new bone growth. This process prevents the natural breakdown of bone, not allowing bones to rebuild to become stronger, thereby keeping bones weak and brittle. Before you turn to potentially harmful drugs such as Fosamax, look for natural alternatives that work with your body’s natural pathways instead. The best way to find out if you have osteoporosis or osteopenia is to get a bone mineral density test. At Hotze Health & Wellness Center, we use a Hologic DEXA scan for diagnosing bone density. It is the preferred method of testing. DEXA (Dual Energy X-Ray Absorptiometry) scan is the most acceptable modality worldwide for the diagnosis and quantification of osteoporosis. (21) DEXA scan technology uses a very low dose of X-ray to measure the bone density at your hip and spine. It’s a simple and quick test that literally takes just minutes! It is ideal for all women and men 40 and over to have a baseline study. Early diagnosis and treatment may significantly reduce the risk of possible fracture. 1. Is Natural Progesterone the Missing Link in Osteoporosis Prevention and Treatment?